I received a scale for a review however all opinions are 100% my own. I know some people don't like to weigh themselves but it helps keep me accountable. Sometimes I will weigh myself right before getting the urge to go out and eat something not so healthy. When I see that I have lost something it prevents me from eating that unhealthy urge. There were times that I was good all week and exercised and walked a lot and didn't have a great number on the scale. I always said maybe I gained some muscle. Muscle does weigh more than fat. 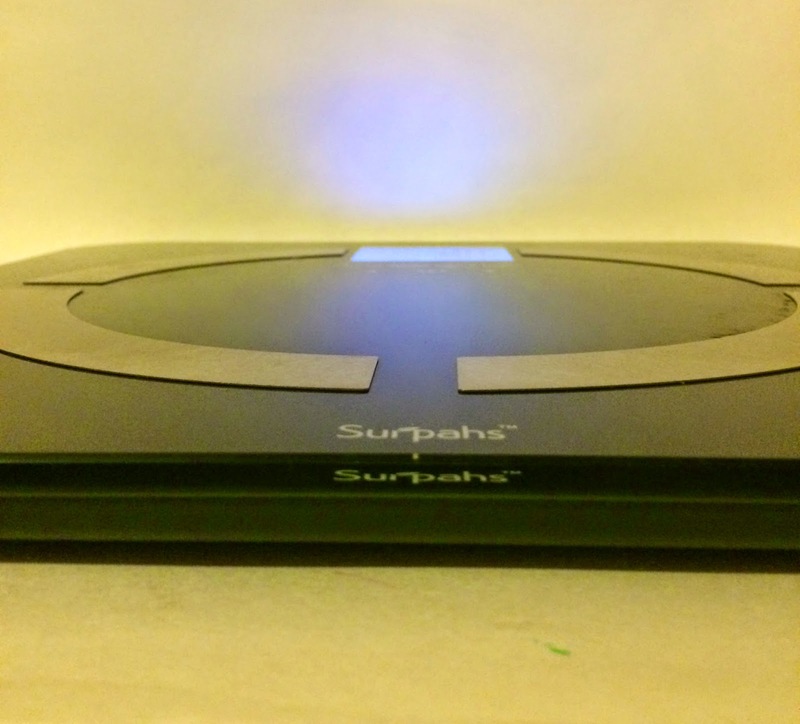 It was perfect timing when I got to review the Surpahs Body Fat Scale. I was excited to get to measure my body fat to see if I really did gain some muscle! The scale measures five fitness indicators: Body Fat, Water, Muscle, Bone & Weight. 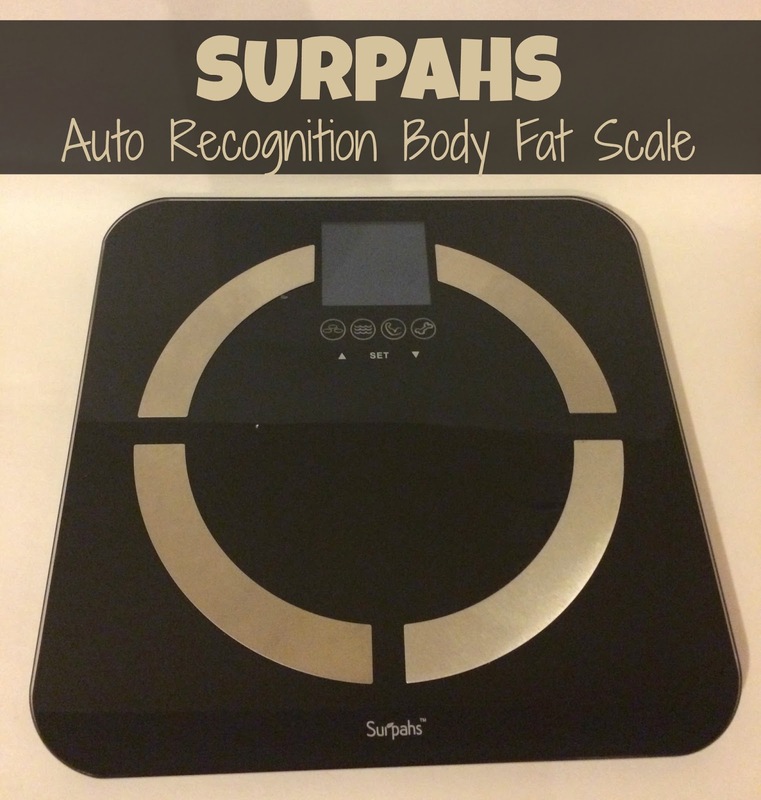 According to the Surpah's website, "The Precision Pro Digital Body Fat & Water Scale uses bio-electrical impedance analysis to identify the various components of your body, and calculates the percentage of each one. It works because fat, water, etc., all have different levels of resistance to a small electrical current sent through your body. This current is not perceptible and is completely safe." Unlike other scales where you just have to pick a user number the Surpahs scale stores personal data like gender, age, height and activity level to give you a more accurate measurement. The cool thing about the scale is that it remembers who you are. You just step on the scale without having to take the time to pick your user profile. It stores data for 8 users so you can use it with the whole family! I also love how nice and sleek the scale is. It has an 11.5" x 11.5" platform so it is easy to stand on. Some scales aren't as wide and it can be difficult to use if you are overweight. The LED display is huge so it is easy to see the numbers. I also love that the scale automatically turns on when you step on it so you don't need to tap and wait. When I learned my body fat percentage I was pretty shocked at how high it was. It definitely motivated me to start weight training. I am looking forward to seeing that percentage go down! If you are looking for a body fat scale with some superior features I highly recommend this one. You can purchase your own scale on Amazon. oh! I need this one to keep track of my body bad fat! Thanks for sharing! And what that does what. Wow. That's pretty impressive. I had no idea a device could tell something like that. I am not sure i would want to know that info.. lol That is a cool scale though, and it would be nice to have something like that..
so nice it stores unto 8 users! Definitely makes it easy for the whole family to use. I would love one of these so I can see how much fat I am losing. The storage component is neat because you can see how much it changed from last time. That will be awesome to track your progress on the scale. I like that it does it with more defining characteristics than some other scales. Wow! Now that is high tech. It might be a great motivator! Hmmm that's really interesting. I wonder HOW it actually works and how accurate it is. Definitely intriguing. Sounds like an amazing scale. Not sure how accurate I would really like it to be (haha) but this one sure seems to be. I like the memory feature. This sounds like an awesome scale. I love all the things it can measure like fat %, water weight, etc. Thanks for the review. I'd love to have a scale that measures body fat. Ours is nice, but it doesn't have that feature, so I'd trade up. This sounds awesome and a great resource to lose weight and know your progress! Very nice! This prolly one of the most advance weighing scale I've seen my entire life. I'll be more happy to wake up everyday and step on that scale to check out my progress. You know, I have no idea what my body fat is and would really like to know. I've been exercising a lot and it would help to be able to compare body fat to muscle. I need this scale! I am totally looking for a body fat scale. We look then never purchase. I really want to know more about muscle and fat on my bones. I didn't know they made such things, but this looks pretty interesting. I want to get something like this, will have to look it up. I need one of these so badly. My scale is so old and out of date now. wow I never heard of something like this.. I need this !!!!!!!!!!!! This is a cool scale. Not sure I want to know my body fat though. I like that it holds several peoples info and you don't have to write everything down to keep track. I do love a sleek scale and I'm in the market for one that tracks BMI and body fat vs. muscle mass. Thanks.